This is a study guide to the play All My Sons by Arthur Miller. 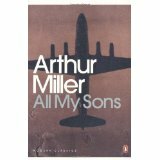 The major theme of the play All My Sons is the conflict between self-interest and the wider responsibility that people owe to the society in which they live. This conflict is mostly enacted through the characters of Joe, Chris, and the now-dead Larry. Joe has put all his energies into making money and building up his business. He was determined to keep his factory production line running, even when it caused the deaths of twenty-one pilots through faulty airplane parts. At the end of Act Two, when Chris realizes that Joe is responsible for the pilots’ deaths, Joe says he did it for the business: “What could I do! I’m in business, a man is in business; a hundred and twenty cracked, you’re out of business …” Please click on the study guide links to the Miller play by selecting the literary analysis category you wish to be displayed. Back and Next buttons can guide you through all the sections or you can choose to jump from section to section using the links below or the links at the left.